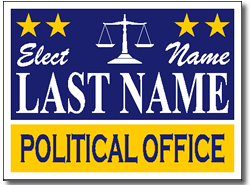 Political Sign Design P62 - One Click Kit. Political Signs with stands included. 24 x 18 political signs and sign stands. Two Color Imprint - customize with your campaign information. Political Judge Election Yard Sign Design features stars and a scales of justice for candidates running for judicial office. Always observe local laws when placing your Political Judge Election Yard Signs.